We have Easter Sunday and April Fool’s Day this weekend in Madrona, but here at the wine shop we aren’t fooling around. We’re pouring French wines all weekend. It’s a festive, frolicking welcome to spring. Bring your bunny and hop on in and join us. A smooth and supple Southern Rhone red with Garrigue notes, plumy fruit and smooth tannins. Madrona Wine Merchants offers free wine tastings featuring 4-5 selections on a theme every Saturday from 2pm until the bottles run out and on Sunday we offer a mini-tasting of two wines all day from 11-5pm. Join us this Saturday as we frolic around France tasting some of our favorite fermentations. We’ll be tasting some fine examples from the Rhone, the Loire, Nimes, and Bordeaux. Swing by. The Brunel family has been in the CDP region since the 17th century, making wine for five generations. The first vineyard was purchased from the Bishop of Avignon line the north. In 1971, André Brunel took over the reins of the Domaine. The Gardine Blanc has very citrusy notes of lemon and grapefruit and a fresh minerally finish. From 30-to 35-year-old vines on limestone soil, the Anciennes Vignes’s lively gooseberry and jicama notes zip along, while a twinge of salty mineral notes add crunch on the finish. Fresh and very bracing in feel. Campuget in Costieres de Nimes is a beautiful property dating back to 1640. The soil is typical for the region, with many stones that force roots to find water deep in the lower layers of clay, contributing additional character to the wine. Their always solid Rosé is full of raspberries and strawberries and has a good, refreshing acidity. This wine comes from vineyards owned by Château Beychevelle that lie just outside the Saint-Julien appellation. Leafy cassis aroma. Dry but extremely creamy in texture, like a creamy coffee but with black fruits through the middle, dark texture and layers of attractive fruit and acidity. The Chaudière Family started this cuvee in 1990 and chose the name “Quintessence” to highlight the exception and the concentration of this wine. Complex and powerful yet with a great balance and a beautiful freshness, it is the result of a drastic parcel selection. Deep ruby color. Intense nose with spicy notes (especially black pepper) and red berries. This very balanced wine offers very round tannins and fresh berries aromas, with some floral and spicy flavors. It has been a crazy week for weather here in Madrona with clear sunny skies one day and snow the next. That’s Spring in Seattle. This weekend we’ll be pouring three Rosés in hopes of the sun breaking through the clouds. Saturday we are pouring some fresh local wines from Sleight of Hand Cellars (Walla Walla) and Torii Mor (Willamette Valley). Go smell the cherry blossoms then come by and taste the taste of spring. Sunday we’ll be sipping on some Southern French wines to celebrate Spring and our new Art Show. The new vintage of this Gascogne rosé has aromas of gooseberry, raspberry, & flowers lead to a balanced palate of aromatic richness. An unoaked blend of Merlot and Cabernet Franc from a rarely seen Languedoc AOC. It is a supple, with fine tannins and a smooth mouthfeel, and ripe blue and red fruit flavors that are accented by spicy notes on palate and the finish. 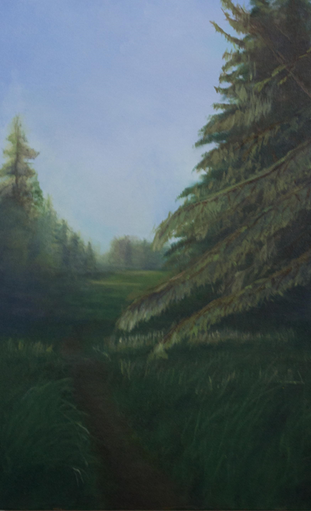 Sunday is also the Artist Reception for Eric Brown’s series of oil paintings: Views of Olympic National Park. Come meet the artist from 3 to 5pm. Spring is here and we are pouring some fresh local wines from Sleight of Hand Cellars (Walla Walla) and Torii Mor (Willamette Valley). Mr. Pink also comes back for his yearly appearance. Go smell the cherry blossoms then come by and taste the taste of spring. From the Underground Wine Project (Mark Ryan and Trey Busch) Mr. Pink is full of fresh picked cherries, crisp watermelon and pomegranates, and lip smacking acidity to balance out the mouthwatering fruit sweetness. This 100% Cabernet Franc Rosé hails from Blackrock Vineyard in the Yakima Valley. It has a gorgeous, pale salmon-pink color, with aromas and flavors of white flowers, juicy strawberries, red cherries, and wet stones. The minerality and fresh acidity keep this rosé light and bright. Torii Mor’s 2016 Pinot Gris displays a light golden color, with a forward aroma of fresh pears and ripe apples with honeysuckle ﬂoral notes. The ﬂavors show a refreshing acidity, followed by those same notes of ripe apples and pears beautifully balanced with delicate aromatic spice notes. The ﬁnish has a long somewhat austere ﬁnish. Elegant and full-bodied, while still approachable, it boasts fresh fruit aromas and flavors of black cherries, raspberries, and currants, with just a hint of cedar from older French oak barrels in which it was aged. The tannins are completely resolved, providing a plush textured finish. Alcesti is a family-owned winery located in the Marsala growing region of Sicily. Gianfranco Palladino, along with his sister, wife, mother and father, proudly share in the operation of this winery. The rich soils of the vineyards, their hard work and care, along with the Sicilian sun, allow the roots of the vines to grow and produce exquisite grapes. The 30 hectares of land that lie between Marsala, Mazara and Salemi, with altitudes ranging from 100 to 280 meters, express the typical Sicilian character. This Saturday we’ll be pouring their wines including two from their Carmene label. Terre Siciliane is the region-wide IGT title for the island of Sicily. Carmene is Alcesti’s everyday line. Made from two indigenous varietals, the wine is fresh and crisp aromatic, and crisp with lively acidity. The grape expresses great structure and minerals. The Edesia is a distinctly intense and persistent wine. It has a strong bouquet of yellow fruits with delicate nuances of citrus fruits and herbs with freshness and a tangy palate. Frappato is one of the oldest grape varieties found in Sicily. Grown in the hilly area around Agrigento, it has a very pleasant and harmonious taste and aroma. The wine is recognizable for fresh and fruity notes of black cherries, blueberries and raspberries and its soft and balanced finish. The Carmene Rosso is a very friendly Sicilian blend with spicy aromas and bitter chocolate tannins. Nero d’Avola is the workhorse of Sicilian reds. It is grown typically of inland hilly areas and expresses all the Sicilian terroir. The Nesos has an intense ruby red in color, with an embracing aroma of red-berried fruits blended with notes of spices and vanilla. It is rich, ample and persistent on the palate with a distinct but pleasant note of freshness. We have a beautiful weekend here in Madrona and it is starting to look like spring. Sunday we turn the clocks ahead an hour and we are looking forward to the longer evenings. While you are enjoying the sun swing by the shop. We have some great wines open. Sunday we will have a couple of French wines open to match the weather. The Muscadet would be perfect with oysters or any shellfish, while the Roussillon leans more to grilled meats and vegetables, or just on its own. Woodward Canyon was founded in 1981, that’s pretty old by Washington standards. They quickly made a reputation for making outstanding Washington wine. They get their fruit from their estate, as well as Champoux, Sagemoor, and a few other select vineyards. This Saturday we will be pouring three of their wines along with a couple of other Washington contenders to even things out. Stop in and see us. In 1998, Woodward Canyon Winery began producing wines under a second label, Nelms Road, from young vineyards and surplus lots of Woodward Canyon Winery production. The Nelms Road Chardonnay has flavors of pear, pineapple, and white peach are melded together. It is smooth and supple and surprisingly complex with neutral oak and bright acidity. Another Walla Walla, Long Shadows winery founded in 2003, makes a wide variety of award winning wines with their bevy of winemakers. The Poet’s Leap is an off-dry Riesling with expressive, spicy aromatics and generous, lively flavors. Fresh melon, honey, ripe apricot and a hint of citrus jump on the palate leaving a vibrant, racy impression and a long, clean finish. 55% Cabernet Sauvignon, 17%, Merlot, 10% Cabernet Franc, 9% Petit Verdot and Malbec. Robert Karl Cellars is a boutique, Spokane winery producing handcrafted wines. The grapes for the Claret are from Horse Heaven Hills (AVA) of the Columbia Valley. It has pleasing aromas of baking spice, cocoa and vanilla lead to a well-proportioned palate, full of dark-fruit flavors that show a reserved styling. 53% Merlot, 31% Cabernet Franc, & the balance being other Bordeaux varieties. Woodward Canyon Estate is the predominant vineyard for this red blend. The very warm 2015 vintage gave beautifully ripe yet balanced fruit with enticing flavors of black cherry, mocha and baking spice. Complex aromas of roasted meat, black fruits and tobacco integrate, leading to a soft generous finish. The wine has lovely texture; and though it was bottled early to retain fruit, is quite enjoyable now. Fruit for this wine comes from Champoux, Sagemoor, Woodward Canyon Estate and Summit View vineyards. Each produces fantastic wine in their own right; when blended they produce extraordinary wine with a complex nose of baking spice, black olive and graham integrated beautifully with aromas of ripe black fruits. In the mouth the wine is rich and elegant, showing subtle notes of herb and black berry. Integrated tannins enhance the texture and give proportion; the finish is complex, generous, and long. While this wine can be enjoyed now it will benefit greatly from additional cellaring and, with proper storage, should develop for ten years or more. Having grown up in the suburbs of Long Island, I had no idea the Olympic National Park would have such a deep effect on me. I have camped and hiked there in all weather extremes. These paintings depict a few of those days. We made it to March here in Madrona with a little bit of sunshine to break up the recent weather. The temperatures are still a bit chilly, but here at Madrona Wine we have plenty of wines lined up to warn you up. Saturday we are tasting six wines from the family run Piedmont winery Ca’ del Baio. Sunday, we have a tale of two Tempranillos with wines from Bodegas Frontauras y Nexus. The two are sister wineries Nexus One (Ribera del Duero) and Fontaura (Toro). Loreto Herrero, the representative of the winery will be her from 2 to 4pm to talk about the wines. But if you can’t make that we’ll have the wines open all day for tasting. The Nexus one has a deep cherry red color. The nose has intensity and freshness. At first floral touches appear followed by subtle aromas of red fruit with dairy notes and hints of caramel. Very intense on the nose, red fruit aromas, strawberry, raspberry, and blackberry are predominate with dairy and well-integrated wood. Touches of eucalyptus, velvety licorice and mineral notes come out. It is smooth, balsamic and very long. It is a structured and complex wine. For four generations Ca’ del Baio has been a family affair with the vineyards surrounding the Grasso family farmhouse being added to over time through marriage and acquisitions. Today the Ca’ del Baio estate takes in 25 hectares of vineyards in the villages of Barbaresco and Treiso, both of which are in the Barbaresco DOCG. Come by on Saturday and give them a try. This fresh and fruity Chardonnay is harvested during the first weeks of September. It comes naturally with a mineral vein from the vineyards soil. The fragrance is delicately floral and fruity, with notes of citrus and exotic fruits. The flavor is dry, cool, and long, with a mineral finish. Grown in vineyards in the Valgrande and Marcarini crus this “very Piedmontese” wine encapsulates the simple pleasures of everyday life. The aroma is intense and vinous, with delicate fruity overtones reminiscent of cherries, wild strawberries and blackberries; taste dry, with good balance and acidity. From younger vines, the Lanhe neb is aged in stainless steel tanks for 4 months before bottling. The wine is fresh but still retains its Nebbiolo character with aromas of fragrant dried flowers, geraniums and slight fruity overtones reminiscent of raspberries. The taste is warm and soft with slightly tannic overtones. Autinbej is made from the best and sunniest parts of their different crus. It is a tribute to Giulio Grasso’s late father, Ernesto, who often used the Piemontese word to describe the best vineyard exposures. The wine macerates on the skins from 9 to 15 days and then matures for 24 months in large Slavonian oak barrels (boti). The nose is an intense, fruity aroma reminiscent of raspberries, jam, and violets that give an ethereal feeling accompanied by sweet spicy notes and hints of cocoa. In the mouth, Autinbej is warm, long, persistent and slightly tannic with an aftertaste of fruity notes. Made from grapes grown on land registry plot number 101 located in Tre Stelle, the 101 has intense aromas with fruity hints of apricot and linden blossom, a sweet light taste with good acidity and a long, fresh finish.